Old map by BERTIUS - Carte de L'Afrique, corrigée et augmentée desus toutes les autres cy deuant faictes par P.Bertius. Publisher: BERTIUS, P./ TAVERNIER, M.
Title: Carte de L'Afrique, corrigée et augmentée desus toutes les autres cy deuant faictes par P.Bertius. Size: 14.9 x 19.6 inches. Condition: A very good and dark impression. Repair of split lower part center fold, 4cm into engraved area. Paper slightly age-toned and some light water staining. 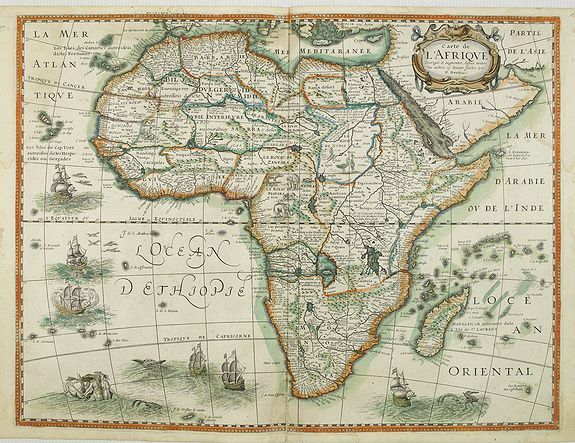 Rare map of Africa, no date. First state, issued by Melchoir Tavernier. Most probably engraved by Cornelis Danckerts (the elder), a highly skilled engraver. Most probably sold separately at first, they did not appear in any atlas until Tavernier's Theatre Geographique du Royaume de France , first issued in 1632. Richard Betz only mentions four copies of this state. This copy is in attractive, typical French colouring. Prepared by Petrus Bertius, who was related by marriage to both Jodocus Hondius Sr. and Pieter van den Keere. 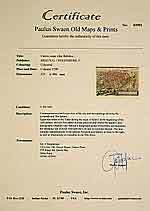 He studied at the University of Leiden and later traveled in Germany and Russia. In 1620 he emigrated to France where he subsequently found employment as cosmographer to Louis XIII. Bertius published a number of folio maps, although never actually an atlas of his own. The maps were either separately issued or included in atlases and books by other publishers. Reference: Betz, The mapping of Africa, 63.1..